바로 스티브 피어슨사에서 출시한 지-샤프(G-SHARP)로 연출하실수 있습니다. 지-샤프는 실(Thread)나 와이어, 마그네틱등을 사용하지 않습니다. 균형을 맞춰낼수 있는 재미있는 연출을 만들어 보세요~! probably already carrying. So it fits right into any routine. The best tricks are simple in method, and this couldn't get any easier. The Sharpie does all the work, you take all the credit! 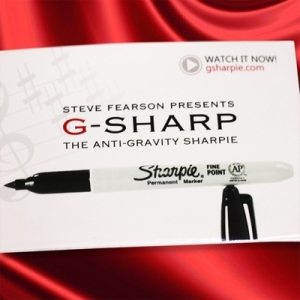 The Anti-Gravity looks, feels and writes just like an ordinary Sharpie. Except this one can defy gravity. be performed at the drop of a hat, ANYWHERE... ANYTIME! f eye candy that will have your audience saying HOW and WOW!